We are heading into autumn, the kids have returned to school, normal life and routine returns. Now is the perfect time to get a new cat. The National Cat Adoption Centre has hundreds of cats and kittens looking for a new home. They are all vaccinated, neutered, microchipped and even come with four weeks of free pet insurance. 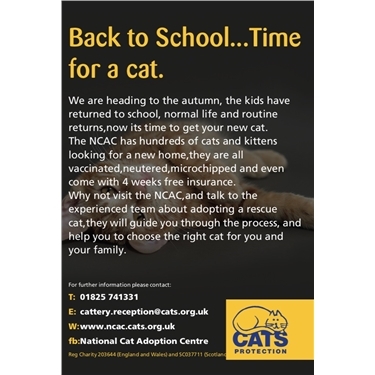 Why not visit the NCAC and talk to our experienced team about adopting a rescue cat. We can guide you through the process and help you choose the right cat for you and your family.